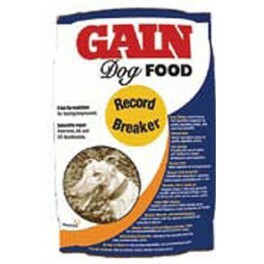 Gain Record Breaker is a complete diet, formulated specifically for racing greyhounds. State of the Art Manufacturing Process: Gain Record Breaker is produced in the top American dog food factory, which is rated world no.1 for consistent quality ingredients and manufacturing technology. 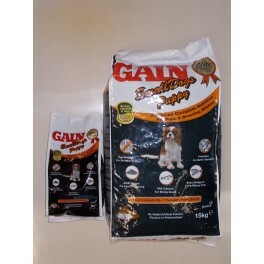 Optimum Energy Supply: An optimum energy supply is provided by the inclusion of brewers rice, maize, chicken fat and canola oil etc, which helps your dog maximise it?s acceleration and stamina throughout the race. Chelated Minerals and Essential Vitamins: The inclusion of a balance of high quality chelated minerals and essential vitamins in Gain Record Breaker is critical for optimum health and performance. Skeletal Growth: The inclusion of TruCal (Glanbia?s unique source of highly available natural milk calcium) helps maintain strong bones and teeth. Ingredient Declaration: Gain Record Breaker is the first greyhound racing diet to declare the full list of its ingredients.